A blue dye for use in contained lakes and ponds. Aquashade® is a concentrated liquid formulation for use in contained lakes and ponds. Contains a blend of blue and yellow dyes to block out specific light rays critical to photosynthesis. 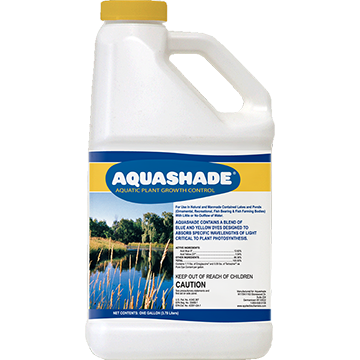 Aquashade® pond dye and treatment is a blend of blue and yellow dyes that work together specifically to screen or shade portions of the sunlight spectrum (red-orange and blue-violet) that are known to promote underwater weed and algae growth. The UV filtering properties of Aquashade® are beneficial for limiting algae growth. Algae can easily overtake a pond and damage its health. By using pond dyes, you can help limit algae proliferation throughout your pond. Use in conjunction with herbicides or algaecides for control of surface algae mats or shallow-water plants. Not for use in drinking water, no restrictions for animal/livestock drinking, irrigation, swimming, or fish consumption when used at label rates. Manufactured by Arch Chemicals, Inc.
Click here for more information about pond dyes. Orders that are $49.99 or less will be charged $8.95. Orders are usually shipped within one day by a ground carrier. US Shipping Only. International Shipping available for the TORMADA®, Goose D-Fence®, LAKEMAID® and select products.